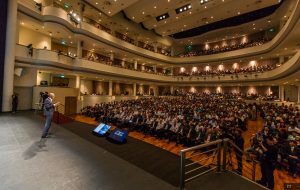 SINGAPORE, 27 May 2016 — Microsoft CEO Satya Nadella reaffirmed the company’s commitment to empower the developer community in Singapore, to support the Smart Nation vision. 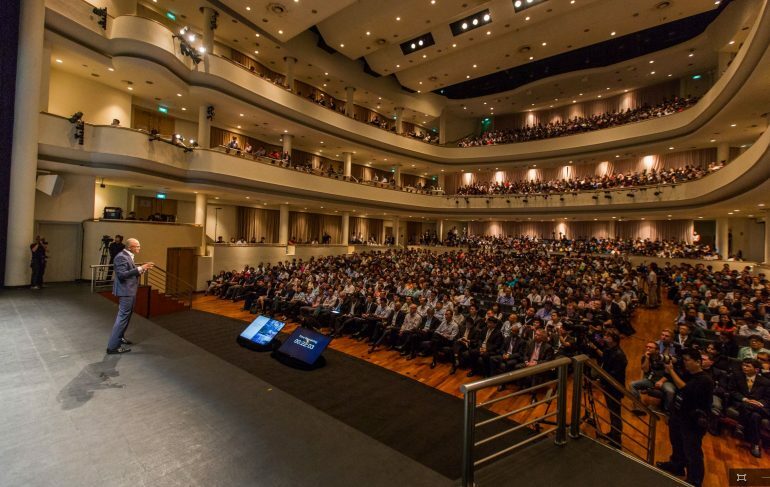 He was speaking at the Microsoft Developer Day event, held at the National University of Singapore (NUS) where he highlighted the need for local developers to harness technology to the fullest, in order to be able to create opportunities, improve the lives of citizens, and build stronger communities for a people-centric Smart Nation. Over 1,700 students and developers attended the event, while an additional 3,000 followed the proceedings via live stream. Microsoft CEO Satya Nadella delivering his keynote address at Microsoft Developer Day 2016 in Singapore. During his keynote, Nadella underscored the role of the cloud and integrated technologies in helping businesses evolve and grow for the future, especially in today’s mobile-first, cloud-first world. He also highlighted that developers are expected to play a key role in enabling organisations to embrace digital transformation, and Microsoft is providing the resources and support to empower them to do so. Microsoft CEO Satya Nadella chats with students and developers over breakfast on their innovations and how they can leverage Microsoft platforms to power new innovations. He shared the example of how young startups such as Overdrive is leveraging the intelligent cloud to provide a true Internet-of-Things (IoT) platform targeting smart devices and sensors on the move. Through the platform, this young startup uses IoT sensors and Azure IoT Suite to provide pre-emptive logistics management and optimisation to fleet owners. In addition to the over 1,000 vehicles they currently support, they have expanded their technology to other areas such as using IoT to provide concerned parents the location of their children to ensure that they arrive home safely. 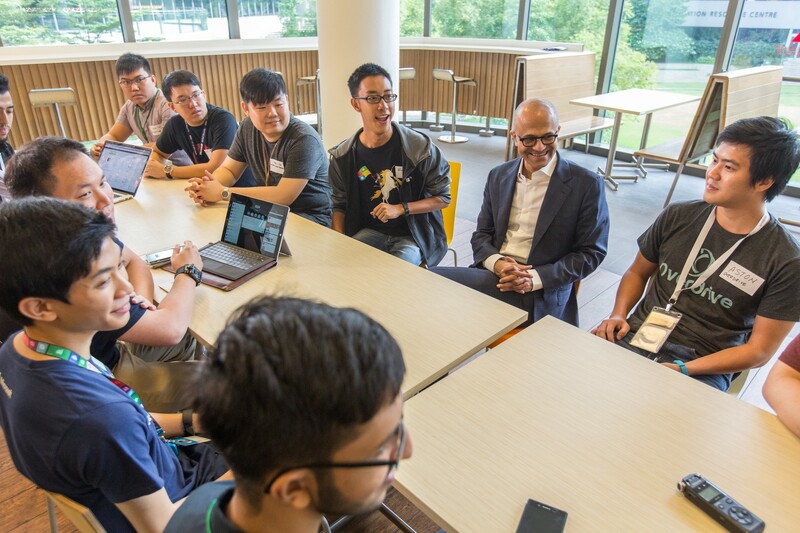 “Microsoft has been working closely with the local developer community over the years. Through our various programmes, we have been empowering them with the tools and support to innovate, to help themselves and others achieve more. With a growing set of intelligent tools and resources that we are making available for developers to leverage, we hope that this will pave the way for them to unlock new opportunities, and to make a greater impact for a smarter and more inclusive Singapore,” said Jessica Tan, Managing Director, Microsoft Singapore. Microsoft CEO Satya Nadella speaking to developers about the importance of the ability to harness the power of data. 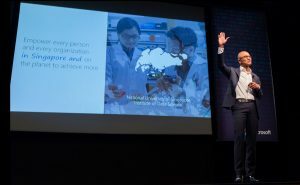 In his keynote, Nadella also highlighted how Astoria Solutions, which provides software solutions to companies in the marine and oil & gas industries, and noted how Astoria has grown from being a Microsoft BizSpark startup to Microsoft’s ISV Partner of the Year in a few short years. Astoria Solutions has since helped numerous companies increase revenue, boost efficiency and improve workplace safety with their solutions, and is now in the midst of expanding their business operations to Houston, USA, and the Middle East this year with Microsoft’s support. In closing, Nadella noted how Microsoft is also committed to nurturing the next generation of innovators to support Singapore’s Smart Nation vision, through a new collaboration with NUS on data science and research. This collaboration will enable the parties to work collectively on data science research with the aim of translating it into tools and methodologies that can be used by the industry and academia; and allow them to cooperate on capability and talent development in analytics and research, with the aim of fostering a pool of skilled individuals equipped with a strong understanding of data analytics and data science. 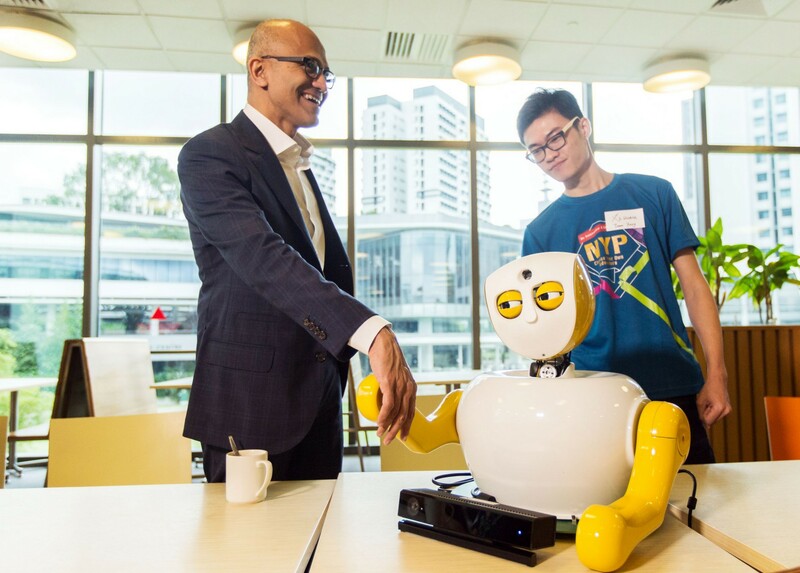 Microsoft CEO Satya Nadella meeting Ruth, an innovative social robot designed by student developers from Nanyang Polytechnic to assist the elderly as a personal assistant. The Microsoft Developer Day event builds on the momentum from Build 2016 held in San Francisco in March, where Microsoft outlined how it would help developers embrace the new era of conversational intelligence and create more personal computing for every customer, industry and business. With Microsoft tools and services, developers can build on, and reach every platform, so they can code the way they want and reach as many customers as possible. Microsoft is also helping developers to build applications for the cloud realities of today, and the cloud evolution of tomorrow. The company is in a unique position to do this, as the only cloud provider that supports every organisation and developer, from core infrastructure services, to platform services and tools, to Software-as-a-Service, with the flexibility to build and run apps in any language across any platform.